Juniper Systems is proud to introduce the Mesa for Hazardous Locations, complete with Class I, Division 2 non-incendive certification. The Mesa for Hazardous Locations is a rugged handheld computer designed specifically for the intrinsically safe market, allowing users to safely collect data where potentially explosive gases, liquids, or vapors may be present. Juniper Systems is proud to introduce the Mesa for Hazardous Locations, complete with Class I, Division 2 non-incendive certification. The Mesa for Hazardous Locations is a rugged handheld computer designed specifically for the intrinsically safe market, allowing users to safely collect data where potentially explosive gases, liquids, or vapors may be present. Approved under standard UL 1604 CSA 213 in the U.S. and Canada, the Mesa for Hazardous Locations is now available for order and shipment, both domestically and internationally. The unique features of the Mesa Rugged Notepad as mentioned above include the unprecedented large active viewing display and universal Windows Mobile® operating system, plus the optional integration of the high performance Mesa 1D/2D barcode scanner. These features combined with the Class I, Division 2 certification promise a unique and powerful solution to improve data collection processes in hazardous locations. The Class I, Division 2 certification is available for all three models (Standard, Geo, and Geo 3G) of the Mesa Rugged Notepad. The Standard Mesa features Wi-Fi® and Bluetooth® wireless technology, while the Geo model adds 2–5 meter accuracy GPS and a 3.2MP camera enhanced with Juniper Geotagging™ (the ability to embed and emboss photos with date, time, and GPS position). The Geo 3G model includes all of the features of the Mesa Geo, plus a 3.5G GSM data modem for increased connectivity capabilities. 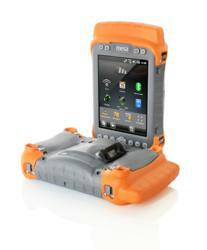 Like other Juniper Systems rugged handheld computers, the Mesa for Hazardous Locations is built to survive the toughest environments. It is built to IP67 standards, making it fully waterproof and dustproof, and designed to MIL-STD-810G standards for water, humidity, sand and dust, vibration, altitude, shock, and temperature. Its rugged magnesium and plastic chassis protects the Mesa from up to four foot drops onto concrete. Based out of Logan, UT, Juniper Systems designs and manufactures rugged handheld computers for mobile data collection in extreme environments. Since 1993, Juniper Systems has provided innovative mobile technology to agriculture, natural resource, industry, geomatics, public works, and military markets.